Playing Spyro the Dragon for the first time as a 36-year-old man, a good two decades after the PlayStation originals released, I wasn’t expecting much. 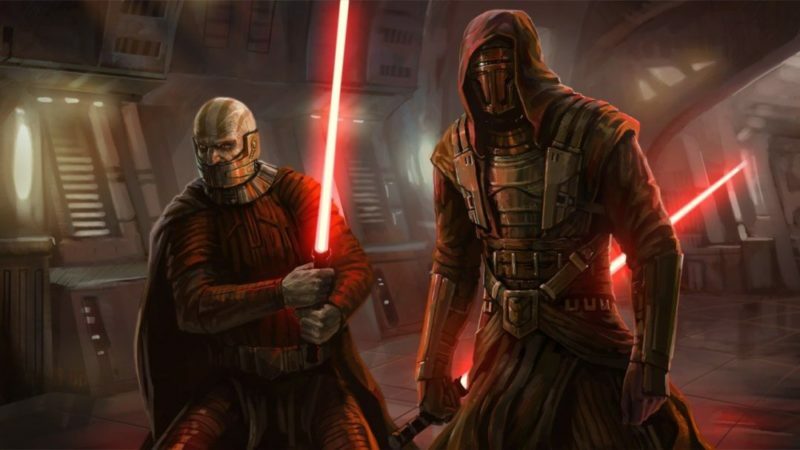 Insomniac Games’ foundational work alongside Michael John and Mark Cerny is beloved years later, but games about jumping through three-dimensional cartoon worlds from the late ‘90s have grown arthritic with age. The Spyro Reignited Trilogy is, after all, a remaster and not a remake that would modernize how the game plays along with how it looks. Unlike remasters like the Crash Bandicoot N. Sane Trilogy whose modern aesthetic sheen only emphasizes mechanical flaws from the original, Spyro Reignited Trilogy both preserves the original series’ cultural legacy and shines new light on its accomplishments. Spyro feels incredible 20 years later, a game that is truly childlike in its giddy willingness to do whatever pops into its developers’ heads with boundless energy and unexpected grace. 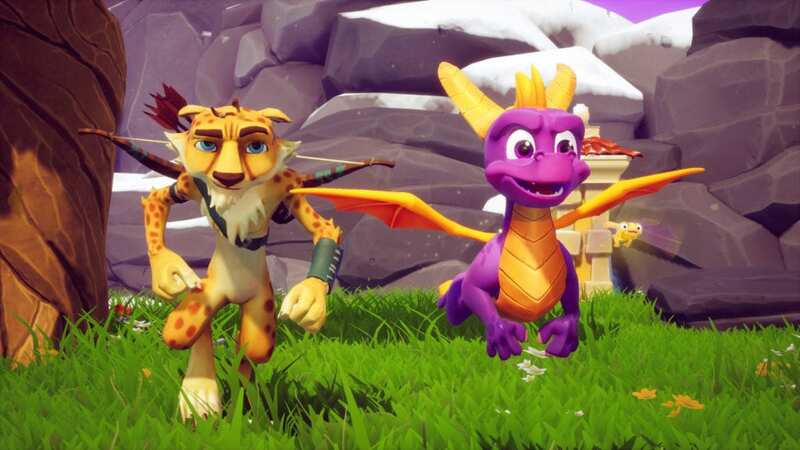 Packaged together, Spyro, it’s sequel Ripto’s Rage, and Insomniac’s final game in the series Year of the Dragon feel like chapters of a single, evolving game since Spyro himself changes so little over the course of the trilogy. These are simple games that are so light that they practically float away after you stop playing them, every colorful stage, pleasant mini-game, and collected gem blending into the next like vivid piles of Play-Doh squished into a single bright blob. All of Spyro Reignited Trilogy just feels great in your hands. Were any part of Reignited belabored, this 2-year-old free association theater feel would be wearying. Playing as Spyro while collecting gems or talismans or freeing dragons — the game always needs you to collect a set number of various gewgaws to unlock access to new stages — feels effortless beyond the light challenges the game puts in front of you. There are no roadblocks or grinding, just a long series of sharp, primary-colored stages to romp through as you visit various worlds. And all of it just feels great in your hands. Running through Spyro’s worlds full of artisan dragons, screeching business lizards, and amiable kangaroos is so instantly pleasurable, it was only later that I realized that there was no prolonged tutorial; I just understood how to play. 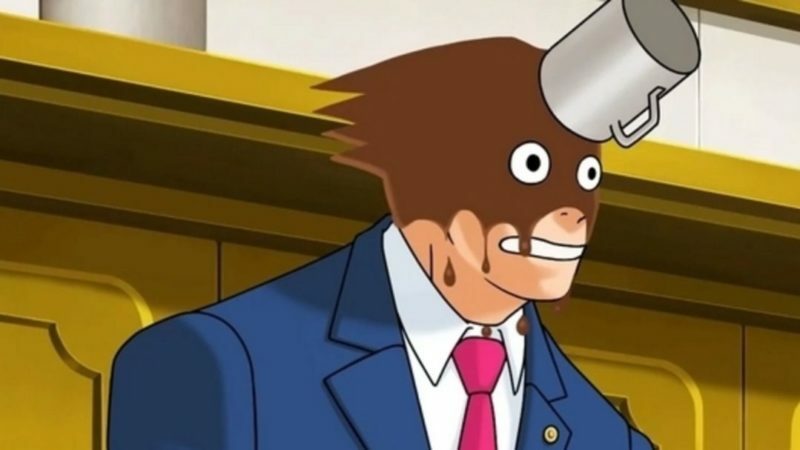 I quickly figured out how to jump, run, breathe fire, and do fun little headbutts, and those simple mechanics were consistent over the course of each game. 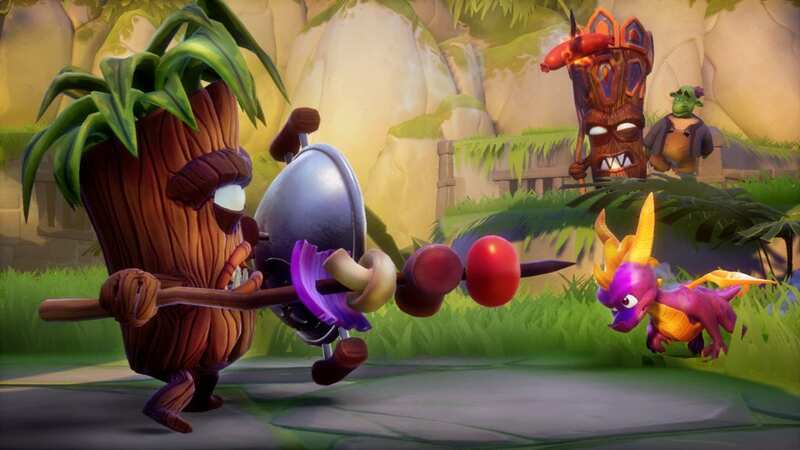 By the time Ripto’s Rage starts throwing in little wrinkles like temporary power ups (more powerful fire breath, super jumps, etc. ), the added complexity feels less like something new you need to learn and more like a smart bit of variety thrown in to keep things from getting stale. Like the kid who comes up with playing freeze tag rather than just tag, Spyro’s always throwing in a pleasant wrinkle like an impromptu ice hockey mini-game rather than a straightforward jumping challenge to get the next macguffin. Year of the Dragon arguably takes this further than it needs to go by adding in a clutch of new controllable characters. Bentley the Yeti and Sgt. Byrd the flying penguin are fun additions (when don’t you want to play around as a yeti?) but none of them feel as pleasant to control as Spyro himself. Going back and trying the original PlayStation version after playing Reignited, I found that Spyro was always this pleasant, always this playable, and Toys for Bob’s major additions here are predominantly quality of life adjustments. Adding in maps of each little stage helps enormously, especially in the original game. Spyro the Dragon on PS1 may still be fun to play, but the aesthetic evenness of the games makes it hard to distinguish some locations from each other. Is this the brownish castle hallway that leads to another stage or the one that leads to a balloon that will take me to the desert? Charmingly silly questions like these are only fun when they don’t leave you running in circles trying to figure out where to go and the map prevents that. Toys for Bob has also made these games look as plush and velvety as possible. 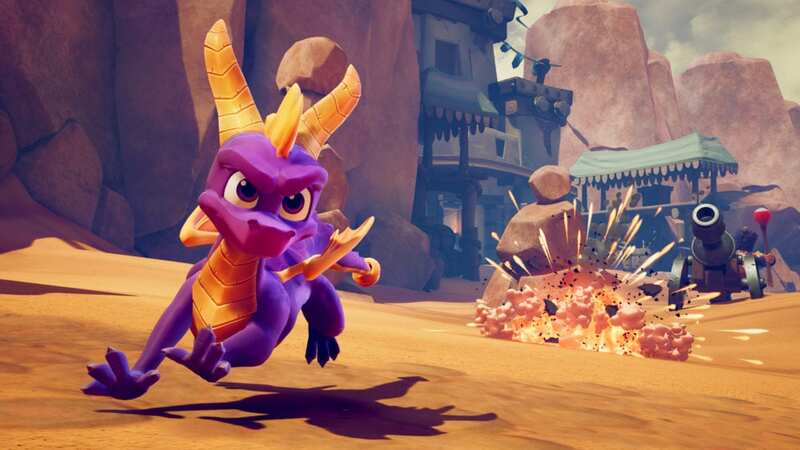 None of the visual noise of Skylanders-era Spyro is here. Everything is lush, detailed, and clean. Weird as it is to say, the King James version of Corinthians popped into my head as I played: “When I was a child, I spake as a child, I understood as a child, I thought as a child: but when I became a man, I put away childish things.” For a certain type of player, even Spyro Reignited Trilogy may not be enough game. There’s plenty to do, but again, it’s all light and even. Someone cutting their teeth on Super Mario Odyssey, a descendant of Spyro as much as Nintendo’s previous Mario titles, may just slide off of this collection. That person might disregard Spyro as being childish, mistaking it’s freewheeling wonder as making it less worthy. For anyone exhausted by endless upgrade systems, infinite unlockables, new skins and every other contrivance meant to ensnare the contemporary player, Spyro’s uncynical good time is a worthy escape. This is one that shouldn’t be put away. Spyro is still a childlike delight 20 years later.